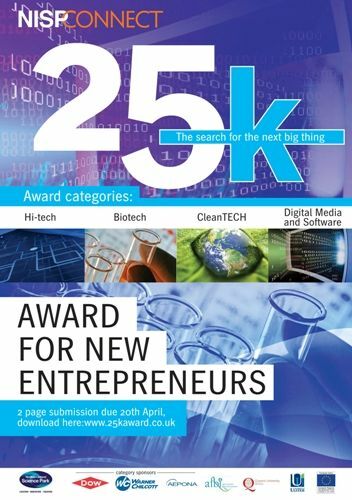 The purpose of the £25k Awards is to identify, qualify, prepare and present the intellectual property from the publicly funded research base in Northern Ireland with the most commercial potential. Administered by the CONNECT programme in the Northern Ireland Science Park, the contest is a commercial educational experience designed to encourage researchers and individuals to act on their talents, ideas and energy to produce tomorrow’s leading commercial opportunities. The competition is open to researchers in HSC trusts. Further details, including eligibility criteria and information about previous winners, is available on the competition website at www.25kaward.co.uk. In the 2011 awards two HSC-connected entrants reached the finals, Clinical Communicator going on to win the Digital Media and Software Category. The formal launch of the competition will take place on 8th March 2012. Applications should be no longer then two pages. HSC researchers considering submitting an entry should contact HSC Innovations well before the application deadline of 20th April 2012. The 2012 launch event will take place in The Innovation Centre, Northern Ireland Science Park, on 8th March 2012, 4pm – 5.30pm. Further details and a registration form are on the programme website at www.nisp.co.uk/?p=2376.